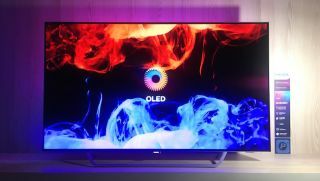 Philips has announced its latest OLED 4K UHD television | What Hi-Fi? Philips's new 2017 flagship television, the OLED 55POS9002, has been announced today at the company's launch event in Madrid. It comes in a 55in screen size, just as the 901F did, and will be available later this summer. Alongside the OLED technology that goes into the television (which meets 4K UHD specifications), the 55POS9002 has three-sided Ambilight, as well as a range of impressive-sounding picture and audio processing settings mentioned in its promotional YouTube video. This includes the new P5 picture processing engine, an apparent 750Nit peak-light performance, and a 99% DCI-P3 wide colour gamut. Philips has also unveiled the 7502 (a 4K HDR LCD range) - which has a 400Nit light output and an integrated 45W amplifier for its soundbar. The triple ring drivers on the rear of the set, according to Philips, "produce a wide stereo soundstage with deep bass, wide stereo separation and perfect clarity." Alongside those are the 6482 and the 6412 4K UHD LED models, which also have triple ring drivers powered by 20W amplifiers and a 400Nit light output. The 9002 and 7502 televisions have smart functionality, controlled by the Android TV operating system, and a Quad-core processor. The 9002 will go on sale during summer 2017, as Philips' new televisions are waiting for Freeview Play certification and, by extension, catch-up services like BBC iPlayer. We have also been told that if you have a 2016 Philips television, it will be updated with HLG support (the new HDR broadcast format) later in the year via an OS update. And finally, Philips also announced it will be implementing Quantum Dot technology for its higher model 4K LCD TVs. Philips gave us a sneak preview of a QD panel - which will most likely form the next iteration of the 8000 series - with full models expected to be announced at IFA 2017.